Due to gyroscopic precession, you'll likely notice something very strange when you move your cyclic RC helicopter controls. “I must have built something wrong or programmed the wrong CCPM mode into my radio” you say to yourself. Nope! All is good. What you are witnessing are the swashplate linkages up to the blade grips compensating for the forces of Gyroscopic-Precession. They will be imparting the force application up to the rotor blades 90 degrees before the actual movement takes effect in the rotor disc. Why? Well, funny, non-intuitive things happen with large, fast spinning masses; and as you can appreciate, our RC helicopter rotor blades become a large spinning mass (the rotor disc) once they are spooled up. Say we are looking down at our helicopter from above. The nose is pointed forward (12 o-clock position) and the tail is pointed back at our feet (6 o-clock position). 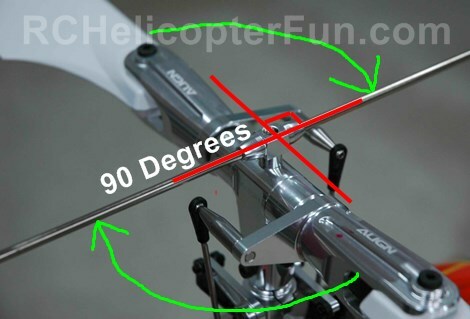 In this example we will assume the rotor rotation is clockwise (the most common direction for most RC helicopters). Now we give a forward cyclic command. The natural assumption is the rotor blade will have more positive pitch at 6 o-clock than at 12 o-clock so the rotor lifts at the back more than the front and pitches the helicopter forward. However because of gyroscopic forces acting on our spinning rotor disc, the lift forces of the rotor actually occur 90 degrees later, or "in front" of where the input force to was applied to our rotor disc. This phenomenon is called Gyroscopic Precession or Torque Induced Precession. For the true heli nerds out there interested in all the cool physics involved, here's decent primer. In the above example with a clockwise rotating rotor and where the rear blade at 6 o-clock has more lift than the front blade at 12 o-clock - our helicopter would actually roll to the right, not pitch forward. Why? Remember, the gyroscopic-precession will cause the force applied to the rotor to occur approximately 90 degrees later in the revolution. So the rotor force actually lifts more a 9 o-clock than at 3 o-clock. The rotor disc wants to tilt to the right and our helicopter follows along and rolls right. In essence, we have just given a right cyclic helicopter control command. This is pretty hard to visualize, but this video will clear it all up! Where in the rotor cycle should the blade have applied more lift and less lift to pitch our helicopter forward with a clockwise rotating rotor? Yes - more lift at 3 o-clock and less at 9 o-clock respectively. What about if the rotor is spinning counter clockwise? Yup, more lift at 9 and less at 3 o-clock. Most RC helicopter or setup instructions don’t include this very useful tidbit of information and believe me, it has had more than a few of us scratching our heads when we first start into the hobby.